Renfrewshire Council has launched a new letting service which gives tenants more say in choosing a property to live in. HomeChoice@Renfrewshire is a choice-based letting service which gives applicants the opportunity to decide where they want to live and the type of property they’d like to move into. Available properties are advertised online and in housing offices in a similar style to the way estate agents market private properties. The scheme is being piloted with newly-renovated flats in both Gallowhill Court and Glencairn Court. If popular with tenants, it may be rolled out to other areas across Renfrewshire. Around 100 prospective tenants came to two recent open days to see the new-look flats and speak to housing advisors about their tenancy options. Councillor Tommy Williams, Convener of Renfrewshire Council’s Housing and Community Safety Policy Board, met with tenants at the open days and said: “This is an exciting new development for housing services in Renfrewshire. “With more involvement in choosing a property, we’re hoping tenants will be happier with the end result and that they’ll feel settled in their new home for many years. 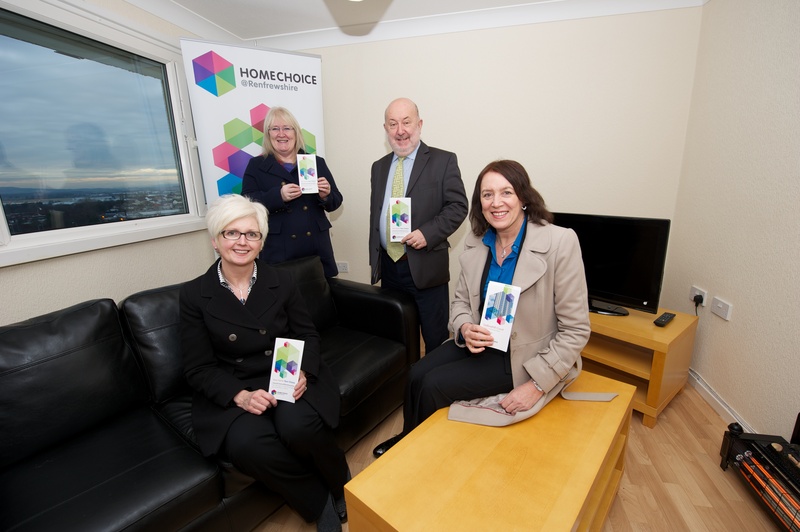 HomeChoice@Renfrewshire is available from Monday 28 January. Properties are advertised each Monday at www.renfrewshire.gov.uk/homechoice as well as in customer service centres, housing offices and the foyers of multi-storey flats. Celebrating the life of Scotland’s bard: BURNS! (Your Bard, By the Way) at Paisley Arts Centre. Robert Burns was a dramatic figure. The events of his life are the stuff of theatre. His humble beginnings as a plough lad, his acceptance by Edinburgh society, the women he loved (and lost) and who loved and lost him, his fiery championing of the underdog are in themselves remarkable. Add to this is talent for finding true expression in the Scots tongue, and you have a man whose life story cries out to be told, over and over again. Written in rhyming Scots, BURNS! (Your Bard, By the Way) is a whirlwind of a play, celebrating the life of Scotland’s bard through hilarious comedy, beautiful song, stirring passion and heart-rending tenderness. Two actors play all twenty roles, moving seamlessly across age, gender and class to portray the people and events that shaped the poet’s life and works. Including a dramatic recital of Tam o Shanter, the play is packed with excerpts from many of the bard’s poems and songs so there is plenty on offer for the Burns enthusiast as well as the newcomer. BURNS! (Your Bard, By the Way) will be at Paisley Arts Centre on Friday 22 February at 7.30pm. Tickets cost £10 (£6 conc) and can be booked by calling our Box Office on 0141 887 1010 or visiting www.renfrewshire.gov.uk/onlinebooking. For further information on Burns! (Your Bard, By the Way), future events and shows log on to www.renfrewshire.gov.uk/events or follow us on Facebook www.facebook.com/renfrewshirearts. Renfrewshire rolled out the red carpet as a senior diplomat visited the area to find out how a Paisley business is helping improve the lives of people in Africa. Bernard Sande, Malawi’s High Commissioner to the UK, had requested to make a special visit to Fairtrade wholesaler Just Trading Scotland. Fairtrade products are those which guarantee that producers in the developing world have been given a fair price for their goods. Mr Sande was welcomed by Renfrewshire Council Leader Mark Macmillan and Councillor Brian Lawson, the Convener and Deputy Convener of Renfrewshire’s Fairtrade Steering Group. They were joined by directors of Just Trading Scotland and by pupils from Gryffe and Trinity High Schools for a tour of the building, before Mr Sande headed over to Paisley Abbey for a discussion on trade. Councillor Macmillan said: “We were delighted to welcome the High Commissioner to Paisley and it is testament to the good work being carried out by Just Trading Scotland that he asked to come here to see it for himself. “He told us about some of the issues surrounding the export of rice from Malawi, and of the impact that the Fairtrade movement has had in his home country. “By buying fairly-traded products, residents of Renfrewshire are helping to improve living conditions for farmers in poorer parts of the world. “People and organisations across Renfrewshire have been involved in a lot of work to help promote Fairtrade over the past few years. “Renfrewshire achieved Fairtrade area status in 2009, and Paisley, Bishopton, Lochwinnoch and Renfrew have all become Fairtrade towns or villages. John Riches, JTS director, said: “We were very encouraged by the enthusiasm shown by the High Commissioner for the work we are doing promoting Malawi Kilombero rice in Scotland. 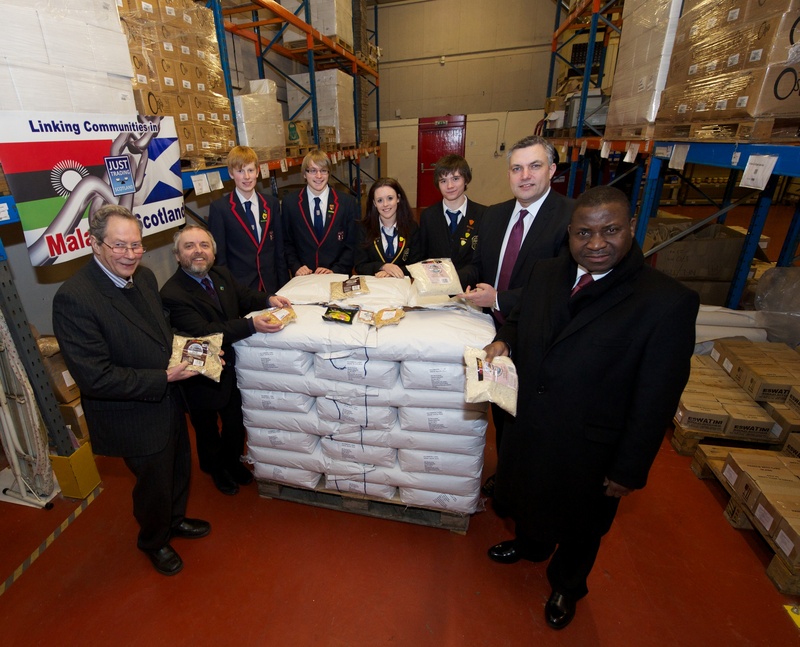 Just Trading Scotland is unique within Scotland in that it imports and distributes Fairtrade goods, while helping to expand the scheme throughout Africa. Renfrewshire Council supports JTS, which based at a warehouse at Wallneuk in Paisley, by helping to provide accommodation. The council’s Fairtrade Steering group features representatives from the council, local schools, higher education bodies and businesses, as well as from the various Fairtrade groups set up in the area’s towns and villages. Malawi is one of the world’s least-developed countries, where around half the population have to live on less than $1 a day, and agriculture accounts for more than a third of GDP. For regular updates on local news and events follow @RenCouncilNews on Twitter or on Facebook at www.facebook.com/renfrewshirecouncil. Tiny tots and their parents showed it’s good to talk when a special bus toured Renfrewshire for a week of fun and games. The PlayTalkRead buses offered parents and carers of children aged three-and-under the chance to climb aboard and find out how to give youngsters the best start. Councillor Jacqueline Henry, the Convener of the Education Policy Board and Councillor Mark Macmillan, the Leader of Renfrewshire Council, hopped on board the bus to speak to some of the parents and children – and take part in a very enthusiastic Bookbug session. Councillor Henry said: “Simple easy steps, such as reading books together, singing songs and playing together, aid a child’s development. The Scottish Government’s PlayTalkRead campaign is in collaboration with Working on Wheels, a charity which manages the Scotland-wide PlayTalkRead bus tour. In partnership, Renfrewshire Council supplied information packs, and were on hand to support and publicise the events. Library staff promoted the Bookbug programme and gave out free books provided by Scottish Book Trust. Renfrewshire Community Health Partnership also provided information on their services to families. As one of only three Scottish planetariums open to the public the good people of Paisley are spoilt with this new Stellar show. The recent £11.5k investment to upgrade our local planetarium comes at a time when others are plunging into darkness and converting into art galleries such as the one in Edinburgh. Paisley should be proud of its ongoing heritage which can now be enjoyed for many generations to come. As you can see from Alex Kyle’s photos, it’s the small touches and detail that add real warmth to this phenomenal show. A custom built 360 degree skyline of many well known and famous local landmarks such as Coats Memorial Church and even Erskine Bridge add real character. A project which aims to improve prospects for school leavers has netted an award of £2,000 from the Glasgow Airport FlightPath Fund. The JETs programme works with young people aged between 16 and 20 in East Dunbartonshire to help them secure jobs, education or training. It is one of two programmes co-ordinated by Positive Alternatives, a diversionary education provider which operates in Bearsden and Milngavie. East Dunbartonshire Council established Positive Alternatives, which relies on a group of 12 local youth workers to deliver its programmes, in 2009. JETs – short for Jobs, Education and Training – targets those who have left school and offers a range of group activities including outdoor pursuits, conservation projects, keep fit, healthy living, sports and wider achievement awards such as the John Muir Trust Award for Conservation. The aim is to build self awareness and improve the participants’ employability, life and social skills. More than 80 young people take part every year and referrals come from a variety of sources including schools, social work and voluntary organisations. The Glasgow Airport FlightPath Fund award will allow the purchase of tools and personal protection equipment such as wheelbarrows, hard hats, goggles, high viz jackets and first aid kits for use in local conservation and community gardening projects. Two teams of young people are currently engaged in conservation projects at Barrhill Fort, near Twechar and Cardowan Moss, near Hogganfield Loch. In partnership with Forestry Commission Scotland, the work carried out has long-term benefits for communities. Councillor Manjinder Shergill, of East Dunbartonshire Council, is a member of the Glasgow Airport FlightPath Fund Board. He welcomed the award: “The JETs programme is exactly the type of project we are keen to support through the FlightPath Fund as it ticks all the boxes – education, employment and the environment. East Dunbartonshire Council’s Convener of Education, Councillor Eric Gotts, said: “These conservation projects are an important element of the JETs programme but if we are asking the participants to carry out physical work in the community then we must provide them with the right tools and safety gear. A scheme to help older people stay out of hospital, and live longer happier lives in their own homes, is to receive a £96,000 cash boost from Renfrewshire Council, bringing the total funding from the council and the Renfrewshire Community Health Partnership to over £250,000. 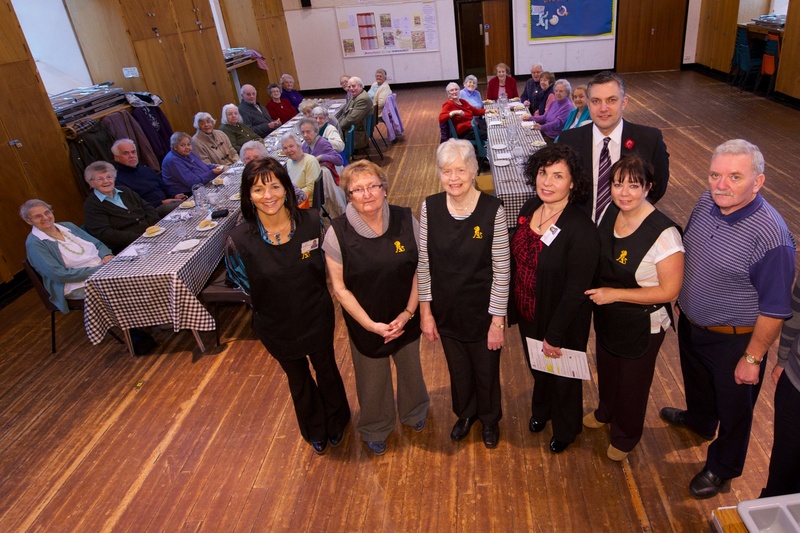 The money will help Reaching Older Adults in Renfrewshire (ROAR) to continue to deliver its range of volunteer-based services designed to counter the negative effects of loneliness and isolation. ROAR started as a pilot project in June 2007 and has gone from strength to strength since then. Currently 150 volunteers provide help to 300 older adults. “As people get older they can become isolated and lonely as their family grows up and moves on and friends and acquaintances pass away. ROAR’s services including; activity clubs, weekly health and wellbeing clubs, a befriending service for older adults and people who suffer from dementia, a pilot shopping service and support for older people who have become isolated. * People whose own support networks may not be adequate and where help would improve their independence and quality of life. ROAR works with Active Communities Scotland (Ltd), Alzheimers Scotland, Linstone Housing Association, Renfrewshire Council and the Renfrewshire Community Health Partnership to deliver its services. Visit their website for more info..
As you can see from our Photographs of Paisley Town Hall, the front scaffold has now been removed and our Town Hall looks splendid. Our photographer Alex Kyle was passing today and took some photographs of it, as well as a group of the Invest in Renfrewshire’s recruits.. The Town Hall is being refurbished for this year’s upcoming Mòd festival which should see this beautiful building being central to the music and festivities. In 1873 George A.Clark, a member of the famous thread family, left £20,000 in his will to build Paisley Town Hall to his native Paisley. Now you can see the stars at any time, thanks to a new digital planetarium at Coats Observatory. The old and the new combined at Coats Observatory recently when Scotland’s oldest public observatory, managed by Renfrewshire council’s arts and museums service, installed a new £11,500 digital planetarium, purchased from the Thomas Coats bequest, which can be enjoyed by daytime visitors as well as those attending the popular night sky viewings. The observatory has had a planetarium since the late 1980s, allowing visitors to view a virtual version of the night sky from the comfort of their chair. Recently the planetarium has been upgraded to a state of the art digital version. This can project thousands of stars in an accurate representation of the night sky, can show the constellations by joining up the stars and then add the constellation art, which helps to show what the constellation represents and how its shape is made up from a group of stars. The projector can also zoom in on many of the objects too faint to be seen except with a powerful telescope. High resolution images of distant galaxies, nebulae and star clusters can all be called up at the push of a button, bringing the wonders of the universe much closer to visitors. All of the planets in our Solar System can also be viewed in incredible detail. Councillor Mark Macmillan, Leader of Renfrewshire Council said; ‘Coats Observatory is one of Renfrewshire’s most unique buildings, experienced by thousands of visitors each year. The Grubb telescope gives visitors to the night sky viewings an incredible opportunity to view the wonders of the universe, but unfortunately our weather doesn’t always work in our favour. The new digital planetarium will allow visitors to learn about our skies at any time of the year and regardless of the weather. This investment demonstrates Renfrewshire council’s commitment to building on the unique assets of this authority and it is hoped that the new planetarium will encourage even more visitors locally, nationally and internationally. As well as its ability to display the night sky the digital planetarium can also show films. These full-dome movies immerse the viewer completely as the image is projected onto the entire roof above their heads. The observatory hopes to expand the library of films available and develop a programme of shows which will bring the most up to date astronomical discoveries to our visitors in an interesting and innovative way. Members of the public are invited to experience this stunning new technology, for free, at the weekly planetarium shows every Tuesday from 2pm to 3pm. Booking is essential and can be made in person at Paisley Museum or by phoning 0141 840 6179. Maximum of 15 places. To find out more about Coats Observatory click here. All Paisley Photographs taken by Alex Kyle find more of photographs on Alex’s Facebook. Paisley town hit the national headlines in18 December 2012 when the Scottish Government rated Ferguslie Park as the most deprived datazone. The damning statistical revelation was published in the Scottish Index of Multiple Deprivation 2012 (SIMD 2012). This was not shocking news for Paisley residents because Ferguslie Park topped SIMD’s most deprived datazone rankings in 2006 and was runners up in 2009. However, the news presented major concerns to the town’s administrators and investors alike because of the backlash it was likely to generate in the local business and political circles. Looking at the bigger picture, though, such panic and pessimism was unwarranted. Truth be told, Ferguslie Park is only but a small section of Paisley and its predicaments do not necessarily translate to doom for the entire town. Trends in the town’s real estate sector and other fundamental economic parameters, tell it all. Real estate is the bedrock of Paisley’s economy but also the hallmark of its heritage. The mere mention of real estate brings to fore the renowned Paisley Pattern that has dominated the town’s architecture for centuries. Save for the property market glut that was widespread in the town and all over Scotland during the 2009 global economic recession, Paisley’s real estate and housing sectors have remained vibrant over the years. Property dealers in the traditional town centre have been raking in millions of sterling pounds as both residential and commercial property uptake continue to flourish. Property developers, estate agents and commercial property insurance providers are experiencing good business tidings. The Renfrewshire Chamber of Commerce has categorically outlined these abundant commercial and investment opportunities in the town. The recently completed property developments have given Paisley streets major facelifts. One such development was the mega student accommodation facility that was completed at the University of West of Scotland’s Paisley Campus. The building was constructed at a cost of £17.6 million provided an additional 336 bed spaces for Paisley campus. The university’s flats in George Street as well as those that located along the Lady Lane were transformed tremendously with repairs that were worth £4.4 million. Indeed, property trends in the town have been changing fast that the Renfrewshire Council issued a directive requiring all privately owned properties to be refurbished or risk demolition. The Council has already commenced repairs on some of its properties, including the Paisley Town Hall and Paisley Arts Centre. 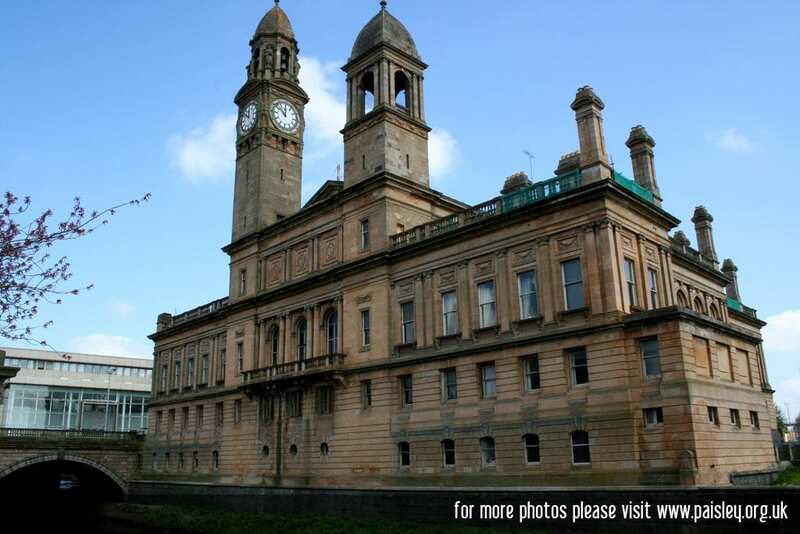 Notably, repairs at the Paisley Town hall will reportedly cost £1.6 million. The Council seeks to conduct thorough repairs on all the public facilities in Paisley that are within its jurisdiction. Private property owners were expected to take cue and ensure their properties met the new architectural benchmarks that have been set in the town. Paisley has been dubbed Renfrewshire’s fulcrum of property for sale and indeed, it has lived up to the billing. The town has been transformed into a bee hive of constructions activities following the realisation of more and more commercial and public planned developments. Some of the major planned developments that are already underway include the Gilmour House, the Paisley Piazza Multi-Story Car Park and Tesco Superstore, Wallneuk. Gilmour House was purchased by FreshStart Living in August 2012. FreshStart Living then converted this particular piece of architectural wonder from its initially intended office space facility to an accommodation facility for UWS students in Paisly Campus. The building has a capacity of 235 flats and students would have sufficient number of en-suite rooms to choose from. It was estimated that Gilmour House would be ready for use during the 2013 academic year. NewRiver Retail, a leading real estate developer in Paisley, acquired the Paisley Piazza Multi-Story Car Park at a record-breaking cost of £68 million in 2011. Paisley 2020 reported that the building was earmarked for extensive renovations that were set to begin in 2013. The planned renovation will significantly improve the town’s parking facilities. Tesco’s plans to put up a hyper retail store right at Paisley’s entry point, Wallneuk, have been underway since 2009. Tesco has been busy preparing and seeking approval for its architectural plan that will see the construction of giant a 24-hour shopping mall. The old structures and facilities that previously occupied the targeted site were demolished in 2012. The planned development is now at its advanced stages and construction activities were expected to commence in 2013. Article written by Evelyn Moffat.